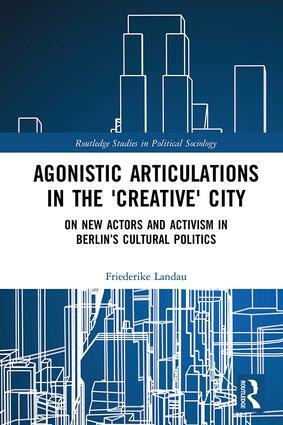 This book offers an empirically-grounded account of the emergence and political activities of a new collective actor in Berlin’s art field. Investigating the organizational and representative practices of Koalition der Freien Szene (Coalition of the Independent Scene) – a trans-disciplinary action platform assembling a wide variety of cultural producers in Berlin – the author unpacks the political organization of one of the most compelling contemporary art scenes, or ‘creative’ cities, worldwide, analysing both its concrete policy ‘success’ and the means by which it seeks to challenge and rearticulate the meaning of Berlin as a ‘creative’ city from the producers’ point of view. The book thus opens new opportunities for long-term transformations of the cultural political field. Theoretically sophisticated and based on empirical material including interviews with spokespeople and cultural administrators, Agonistic Articulations in the ‘Creative’ City presents a unique conceptualization of new modes of political collectivization, representation and legitimacy that imagine new avenues of political engagement at a time when political institutions, parties and regimes of representation are in crisis. As such, it will appeal to scholars of sociology, political science and urban studies with interests in social movements and cultural activism. How to institutionalize agonistic agency?